Ovarian cancer is often diagnosed at an advanced stage and frequently develops resistance to platinum chemotherapy. Identifying new drug combinations to overcome platinum resistance is a critical clinical challenge. 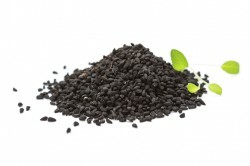 Thymoquinone, a component of black seed oil, exerts multiple anti-tumorigenic effects on cells. Andrew Wilson, Ph.D., Fiona Yull, Ph.D., Dineo Khabele, M.D., and colleagues tested whether thymoquinone enhances cisplatin toxicity in cultured ovarian cancer cells and in a mouse model of ovarian cancer. They report in the Journal of Ovarian Research that combined thymoquinone and cisplatin had synergistic anti-tumor effects in cultured cells. The drug combination reduced tumor burden and cell proliferation and increased cell death in vivo – effects associated with enhanced DNA damage compared to either drug alone. The researchers also observed that thymoquinone alone in mice had an unexpected deleterious effect of increasing ascites (abdominal fluid) production. The findings support targeting DNA damage as a therapeutic approach to improve cisplatin response in ovarian cancer; however, they suggest caution in using thymoquinone in these patients. This research was supported by the National Institutes of Health (grants CA113734, CA148887) and by the Department of Defense.